Is there a reason that none of these cars are a reality? Do you ever find yourself contemplating cars that you know people would want but that, for some reason, don't exist? For example, why can't we buy a new Subaru STI hatchback or a Ferrari F12 with a manual transmission? These cars should be available and we can provide a strong argument for why. In fact, we've come up with five ideas for new cars that currently do not exist, but have a legitimate reason for doing so. Let us know if you've had the same idea about another car that's not on the list. A Three-Seater Supercar The McLaren F1 may be 25 years old already, yet it remains one of the greatest cars of all time. There were many things that made the F1 great, but it's the three-seat layout that particularly stands out. In the McLaren F1, the driver sits in the middle flanked by passengers on either side. We don't know why more supercars haven't adopted this type of seating. Having the seat in the middle is incredibly cool, and it makes the car more practical by having an extra seat for another passenger. We hope that the rumored hypercar from McLaren will have a three-seat layout like the legendary F1. An EV Rolls-Royce That Drives Itself Whenever we think of driving a Rolls-Royce, we think of sitting behind the wheel of one of the quietest and most luxurious cars on the planet. Rolls-Royce V12 engines are so smooth, they are practically silent, but what if they actually were silent? Tesla has proved how advanced EV technology can be, and we think that a completely silent EV Rolls would be cool. Better still, what if Rolls-Royce borrowed Tesla's ideas for self-driving technology? A Rolls-Royce is best enjoyed from the rear seat anyway, so why not have it drive itself? A Four-Door Convertible Why do automakers no longer build four-door droptops? Lincoln used to build a Continental convertible with rear suicide doors, but unfortunately that car is mostly remembered for its roll in the assassination of President Kennedy. There are some custom companies that build four-door convertible models, such as Newport Specialty Cars, but we think that it's time for a major automaker to bring back the four-door convertible. Even large convertibles like the S-Class have small back seats, so a four-door convertible could fix this issue. An Affordable American Super Sedan Before anyone interjects that the Chevy SS is an affordable American super sedan, we do have a point to make. It's very difficult for us to say anything bad about the SS as it's one of our favorite cars, but 415 horsepower isn't exactly groundbreaking by today's standards and the CTS-V is too expensive and no longer comes with a manual. Australia makes much more powerful cars that are based on the same platform as the SS, but we don't understand why Ford or GM doesn't a comfortable sedan with lots of power. The Dodge Charger Hellcat seemingly has the market all to itself. A True Wrangler Competitor The Charger Hellcat is not the only FCA car that doesn't have a lot of competition. 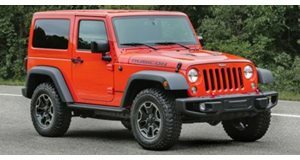 There isn't currently anything on the market that competes against the Jeep Wrangler. Over the years, some cars like the Ford Bronco, Land Rover Defender, and Toyota FJ Cruiser have tried to take some of the Wrangler's market share, but none have lasted. There must be an automaker out there than can defeat the Wrangler. Perhaps the revived For Bronco will be a true competitor for the inimitable Wrangler.